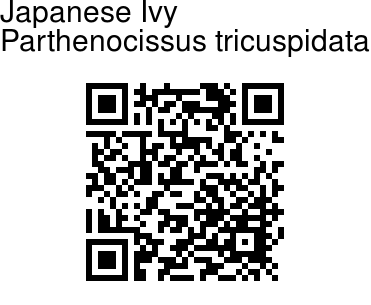 Japanese Ivy is a deciduous woody vine growing to 30 m tall or more given suitable support, attaching itself by means of numerous small branched tendrils tipped with sticky disks. The leaves are simple, palmately 3-lobed, occasionally unlobed or with five lobes, or sufficiently deeply lobed to be palmately compound with (usually) three leaflets. Leaves are 5-22 cm across. Flowers are inconspicuous, greenish, in clusters. Fruit is a small dark blue grape 5-10 mm diameter. It is widely grown as a climbing ornamental plant to cover the fences and walls. Its use for this in Boston, Massachusetts, United States has resulted in one of the common names. 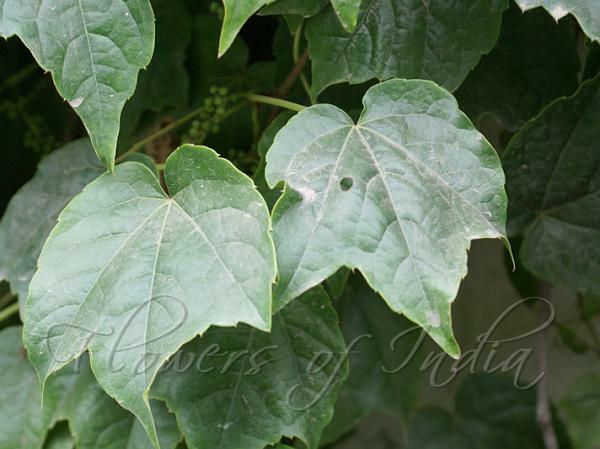 Japanese Ivy is native to east Asia, particularly Japan and China.